Everyone has a favorite cocktail recipe that they first tried when dining out at their favorite restaurant. 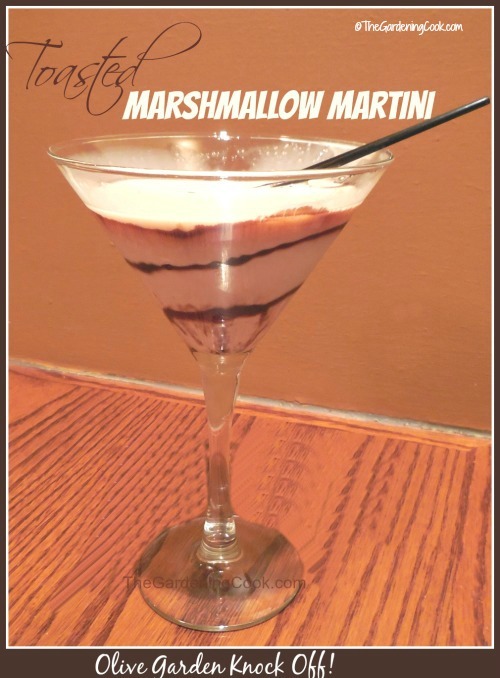 This Toasted Marshmallow Martini is one that I had for dessert at the Olive Garden. The Toasted Marshmallow Martini is a sweet and rich cocktail. Every Sunday, I get a night off from cooking. My husband and I go out to various restaurants in the area and get a great meal and catch up and relax. This week we went to the Olive garden. I like to try cocktails that I have not had in the past. The Olive Garden had a seasonal drink on their menu called a Toasted Marshmallow Martini. Oh my…it was goodness in a glass! Just plain delicious and quite decadent. Even my husband (who normally does not like “ladies” drinks) thought it was wonderful. I decided that I do not want to only have it when I have to pay $6.99 for it, so here is a knock off version of it. The drink is something else. Taste more like dessert than a cocktail. I sipped a bit on it at first and then ended my meal with it instead of desserts. The flavor is just scrumptious! To learn how to drizzle a martini glass, check out this article. Start by piping cold chocolate syrup on the inside of a martini glass. In a shaker place the ice cubes and the rest of the ingredients. Shake vigorously until well mixed. Strain into the martini glass and enjoy! Excellent but where can you find the toasted marshmallow syrup? My local liquor store did not have it.